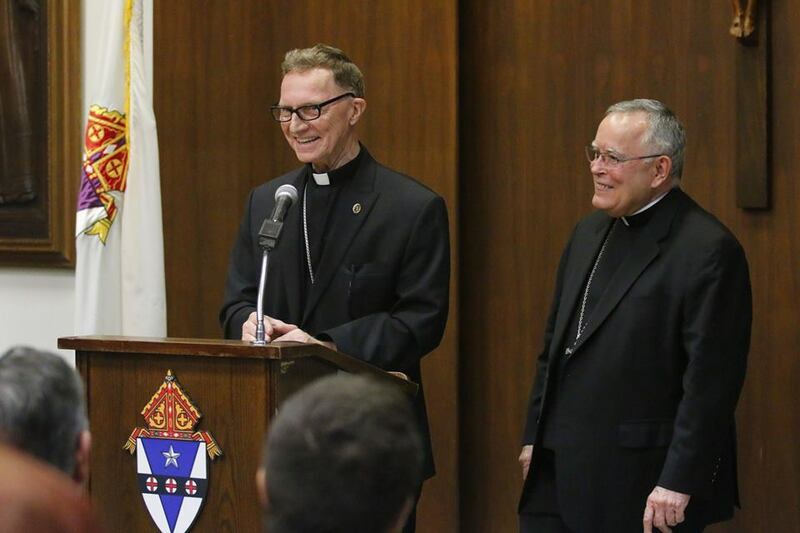 Years in the making, it's finally come to pass: for the first time, Philadelphia has a Spanish-fluent bishop... yet one who'll likewise please the Anglos as he's not coming in from outside. At Roman Noon this Tuesday, the Pope named Msgr Ed Deliman, 69 – a lifer in the trenches and currently pastor of St Charles Borromeo in Bensalem, just over the city's northeast edge – as the 27th auxiliary of the 1.1 million member church, the first such appointment given Archbishop Charles Chaput OFM Cap. since his arrival five years ago. A member of the last mammoth class to be ordained for the River City – 1973's group of 45 priests – Deliman is the first of the storied crew been elevated to the episcopacy. Widely known and deeply well-regarded for his dedication, kindness and hard work amid oft-difficult situations, the bishop-elect's ministry over seven pastorates has been concentrated in two settings: the violence and drug-wracked heart of the nation's poorest major city, or tending to the burgeoning pockets of Hispanic influx around the five-county archdiocese, which have rapidly mushroomed over the last two decades. Yet even as the Latino presence has experienced a significant uptick across the turf, it still only comprises some 20 percent of what's long been the nation's least-Hispanicized major fold, though the bloc continues to grow at a remarkable pace with each passing year. With the boom reflected in the three critical areas of immigration, baptisms and RCIA classes, landing a Latino – or, as it turned out, a fluent Anglo – has been the top priority of the auxiliary search from its very outset. On a context note, as the Hispanic appointee pool of future US bishops is almost always drawn from a national list, given a scenario that now sees the community comprising a near-majority of the nation's 70 million Catholics while claiming just 15 percent of Stateside priests, demand for a Latino prelate has overwhelmingly outstripped the available supply, a crunch that's not infrequently led to A-list battles over who receives one or another prospect. With the move, Philadelphia – its Irish-dominated Establishment famously allergic to outsiders – remains the last major US diocese which has never received a bishop from a "minority" community, as well as the lone domestic outpost whose auxiliaries have only ever been chosen from within its own presbyterate. On another front, however, the traditional identikit of a Philly auxiliary – a priesthood mostly spent in the Chancery rungs – has been dispensed with for the first time since 1981, when then-Msgr Louis DeSimone was made the archdiocese's first bishop of Italian descent from a ministry completely rendered in parishes, where the legendary pastor – still spry and active at 94 – remained for the duration of his active days. Along these same lines, between Deliman's lack of an office background and the demand he'll face to be present among overflowing communities which span the field from the city's core to the rural, agrarian edges of the five counties, the shape of the bishop-elect's portfolio upon his 18 August ordination remains unclear and will largely be his to determine. For the time being, the appointee will remain as pastor at Bensalem, where his efforts to pull off a challenging 2013 merger of Latino and Anglo churches were tracked by CNN in the run-up to September's papal visit. At the time, today's pick put the reality of things this way: "The face of our Church is changing. The face of our nation is changing. The face of this parish is changing." And so, this 65th anniversary of the death of the first Philadelphia cardinal – Dennis Dougherty, the native son who reigned in omnipotent glory for 33 years – brings yet another turning of the page, and with it a different age's palpable sign that, going forward, the way "things have always been" is largely no more again. On the wider docket, today's nod is one of several long-pending auxiliary files tipped to be filled either by the end of the "Vatican year" in late June, or shortly after the Curia returns from its summer hiatus: other dioceses awaiting new assistant hats include Baltimore, Houston, Miami and Orange, the latter three sees understood to require a specialized "type" of nominee to fill specific needs. As previously noted, with Archbishop Christophe Pierre soon to arrive in Washington to begin his mandate as Nuncio to the US, some added delays are likely as the Frenchman familiarizes himself both with the existing files and the lay of the land, all the more amid the impending moves on the all-important Eastern trio of Rockville Centre, Arlington and Newark, each formidable in numbers and influence, and all practically certain to go to existing bishops, which will set off a chain reaction to fill the seats they've left behind.